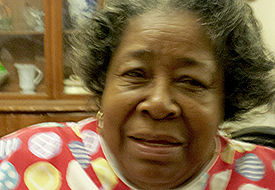 Mrs. Barefield is a senior citizen living with her daughter, granddaughter, and three great grandchildren in the Germantown house she bought 38 years ago. 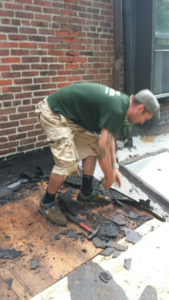 She contacted the First United Methodist Church of Germantown looking for a reputable contractor who could repair an exterior wall and leaky roof. She had employed several “contractors” in the past – each of them had taken advantage of her by either not doing the work properly or taking her deposit and never returning. URDC determined that between her Social Security check and her daughter’s assistance, she might be eligible for a loan. She applied and received a $5,200 loan for repair of the wall and partial replacement of a roof. Mrs. Barefield also had extensive damage in her kitchen and pantry as a result of water damage, with rotted windows and mold in the walls and ceiling. URDC provided a grant of $3,800 to make all of the needed repairs in the interior of her home. 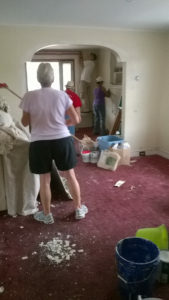 Six weeks later, a group from First United Methodist Church of Germantown painted Mrs. Barefield’s living and dining rooms that had not been painted in over 20 years! The total cost of all of Mrs. Barefield’s work would have totaled $13,000. URDC was able to complete the work for $9,000. URDC was able to creatively stretch its resources – loans, grants, and church volunteers – to enable a family to live in a much safer, more comfortable, and aesthetically pleasing home.